Zellweger AG NEMA / T.D. After wire bound and wireless communications equipment was used more frequently in the armed forces, the demands for transmitting information in secrecy or for encryted message transmission was growing rapidly. A simple means was using simple coded messages or code books. Coded messages could be used for standard message contents using the so called "disguised messages": "Black eagle calls red hunter, contact at h+3 at meeting point charly..." There has been the so called "Combat code" for standard technical or tactical messages. To encrypt messages between staff, the so called "règlette" mechanical ciphering aid or ciphering pads were used. In 1938, the first ENIGMA ciphering machines were ordered from the German Heimsoeth Ciphering machines company in 1938 to be used with the high power shortwave station G1,5K. 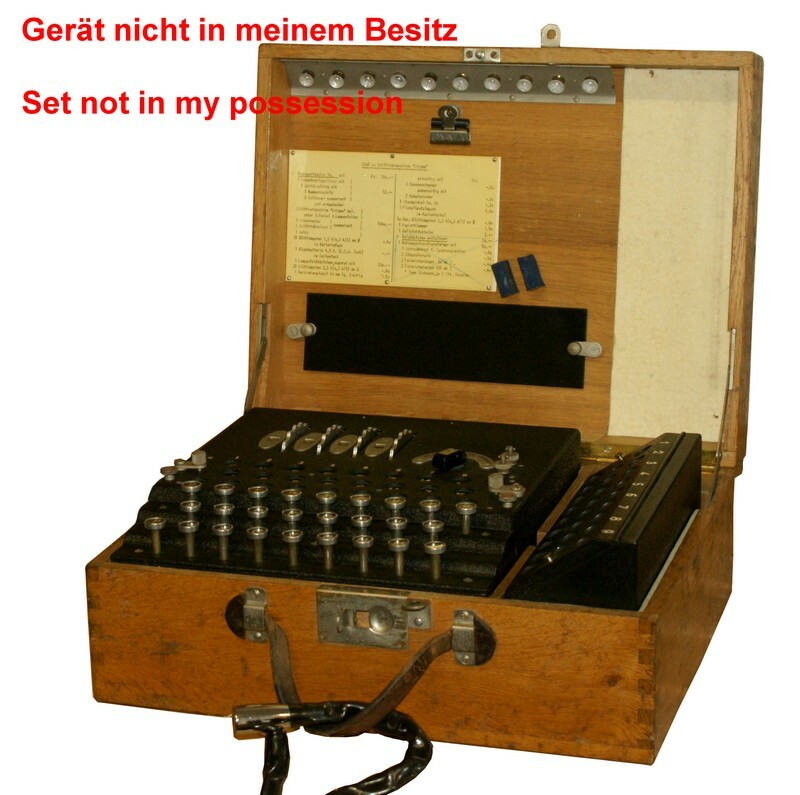 After the British Forces were successful in cracking the German Wehrmacht`s messages encrypted with the ENIGMA, the Swiss messages encrypted with the same (or at least very similar) machines were considered as not beeing secure any more. In 1938, fourteen ciphering machines model ENIGMA K (the commercially available variant of the ENIGMA sold by "Chiffriermaschinengesellschaft Heimsoeth & Rinke" at Berlin - Wilmersdorf) were ordered to be used with the high power shortwave stations G1,5K, from february 1939 until june 1940, more machines up to a total of 265 ciphering machines were ordered. The ENIGMA is a ciphering machine based on the principle of rotating wheels: the key is entered by setting the four coding wheels to a base setting according to a day`s secret key. The ENIGMA K, the commercially availabe and slightly simpler variant of the German Wehrmacht's ENIGMA comes with a reflector wheel which will not be moved during operation and three rotor wheels numbered I to III, these can be mounted in different arrangements in the machine according to the day`s message key. When one of the 26 letter keys of the typerwriter keyboard of the ENIGMA is depressed, one of the 26 lamps showing another letter in the lamp field is lit, according to the setting of the four ciphering wheels. With every keystroke, the right position rotor wheel is moved ahead one step, so when the same letter key on the keyboard is depressed, another lamp is lit. After one complete turn of the right position rotor wheel, the middle rotor wheel is moved one step, and after a complete turn of this one, the leftmost rotor wheel is modes ahead one step - a similar arrangement as found in an odometer. The original text is typed in with the typewriter - like keyboard, the encrypted message can be read from the lamps lit, it has to be written down an handed over to the wireless operator to be transmitted. An external second lam field, which could be connected to the machine by a multipole connector, can be used for nearly real time encryption. One signals operator keys in the original message, a second wireless operator reads the code letters from the second lamp field and operates the transmitters morse key. Most of the Swiss ENIGMA machines have been attributed to war reserve in 1958 and were liquidated in 1975. A small number of machines has been kept as a reserve for the Emergency network of the Airforce / anti aircraft forces until 1989 and 25 of these machines were sold to the public.